Product prices and availability are accurate as of 2019-04-12 14:40:54 EDT and are subject to change. Any price and availability information displayed on http://www.amazon.com/ at the time of purchase will apply to the purchase of this product. 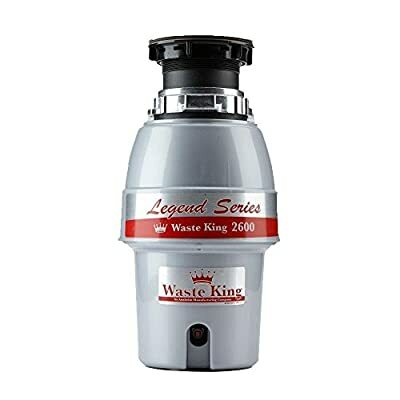 Waste King L-2600: 1/2 horsepower garbage disposal with pre-installed power cord and sound insulation. Energy efficient permanent magnet motor and stainless steel swivel impellers help reduce jamming. Fast and easy to install with a removable splashguard that is easy to clean and replace. Rust and corrosion-proof glass-filled nylon grind chamber and drain housing with stainless steel grinding components. Continuous feed technology. Front-mounted reset button for easy use. Safe to use with properly-sized septic tanks.